The Philips plant in Klagenfurt, southern Austria is part of Philips’ consumer lifestyle sector and one of 8 international product development centers. 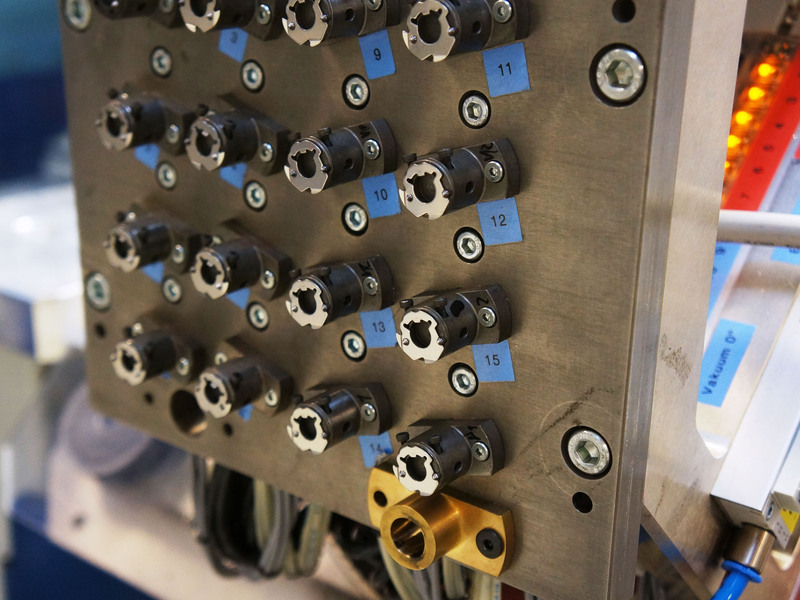 Klagenfurt is not only the leading innovation center for kitchen appliances, but also produces highly complex key components for shavers and epilators, and drive systems for the well-known Philips Sonicare toothbrush. 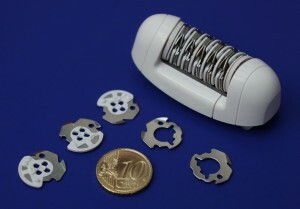 In manufacturing tweezer discs made of metal and plastics for epilators, which have been produced unchanged for more than 20 years, Philips relies on machine and automation technology from Wittmann-Battenfeld. 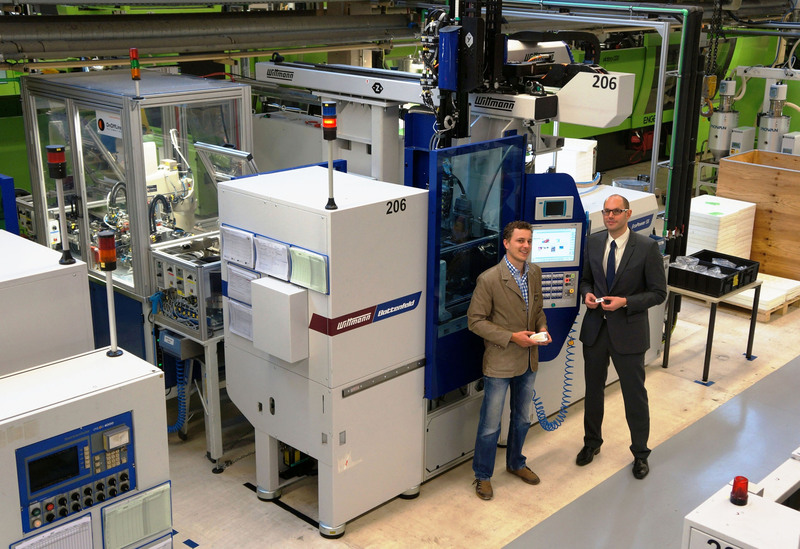 Most recently, the existing production capacity of four machines has been further extended by the acquisition of a new all-electric EcoPower 55/130 injection molding machine. It is able to produce the parts considerably faster and consumes only half as much energy. Good reasons for a status report! Epilators are electric appliances for mechanical hair removal, which look very similar to shavers on the outside, but are completely different in terms of design and function. While shavers cut off the hairs on the surface of the skin, leaving the hair roots untouched, epilators pull the hairs out of the skin with the roots. What is done manually by gripping, holding and tweaking individual hairs with tweezers, the electric appliance achieves by means of a rotating roll consisting of tweezer discs which rotate with eccentric movements. This causes the distance between the discs to vary, with the result of hairs being gripped automatically, pulled out and subsequently released again – similar to working with a pair of tweezers. Epilators constitute a relatively new product line. Originating from the USA, they gradually became more popular in Europe after World War II, and have now been part of the production program of electric appliance manufacturers such as Philips for some 25 years. The tweezer discs, originally made exclusively of metal, have now been produced as hybrid parts consisting of steel and plastics, or two different plastic materials, for the last 20 years. Each of the steel/plastic parts consists of a chromium steel disk which is overmolded with PA segments in an injection molding machine (Fig.1). Alternatively, all-plastic tweezer disks are now being manufactured for the premium appliance market segment, with a hub consisting of a polyamide 6.6 blend and a concentric segmented ring made of a wear-resistant PA 6.6 compound with a high content of fiberglass and zirconium oxide. At the Philips plant in Klagenfurt, the tweezer discs described above have been manufactured for more than 20 years. To produce the metal/plastic version, Philips has relied exclusively on Battenfeld injection molding and automation technology right from the beginning. The start was made in 1990 with two hydraulic 250 CDC machines from Battenfeld (25 tons clamping force) with the Unilog 4000 control system from Battenfeld Austria, plus Battenfeld Unirob robots and a separation and pick-and-place station for the metal inserts. A few years later, two more machines were added, which are still operating today and are also used to produce high-precision mechanical plastic components for lady shaves and men’s beard trimmers. 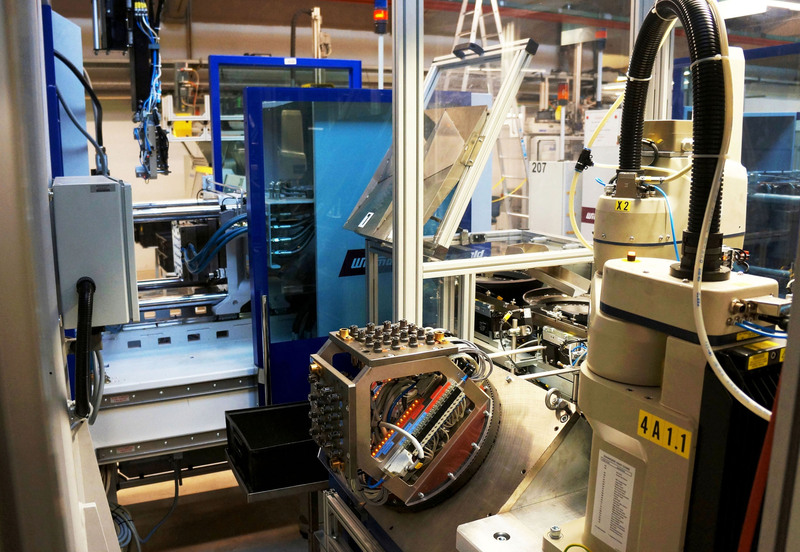 These machines now have more than 100,000 operating hours “under their belt”, but are still going strong, especially thanks to the peripheral automation equipment designed with innovative simplicity for sorting and separating the metal parts and feeding the end-of-arm device. The special highlight of this machine concept is a facility for monitoring and switching off individual (defective) cavities (Fig. 2). 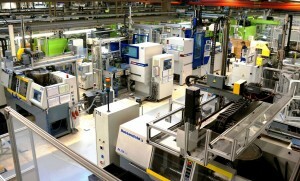 The said EcoPower is an all-electric machine with servo motor drives for all main movements (clamping unit including ejector, and metering/injection carried out by the injection unit), which is also equipped with an integrated, encapsulated servo-hydraulic component as drive unit for a fast mold clamping system, core pulls and contact pressure for the injection unit. Martin Varch continues: “A special challenge in planning the line concept was the fact that, compared to the original investment, the machine dimensions have grown, while the height of the hall of only 3.5 m below the crane runway has remained unchanged. 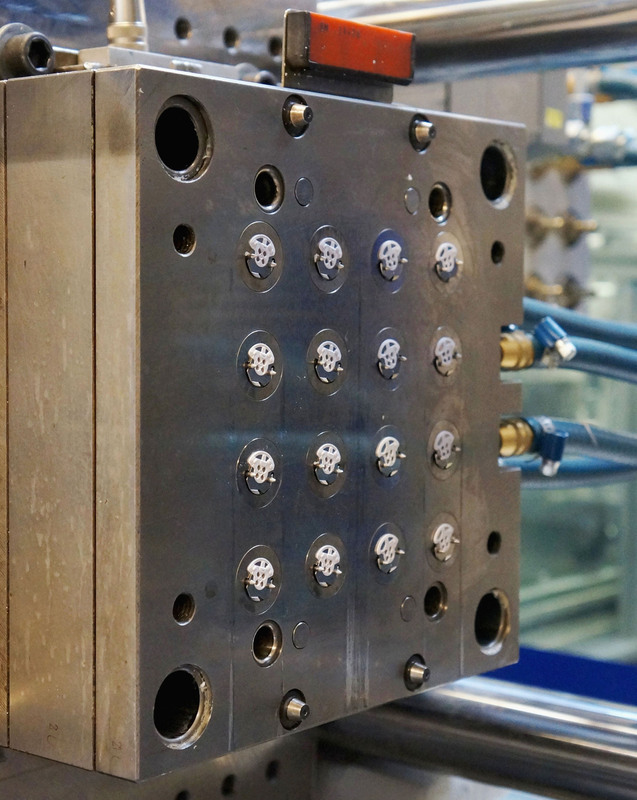 The solution was to supply the handling device as a “stand-alone appliance” beside the machine and to fit it out with a shortened Y axis. Its Z axis is still connected with the machine, but with most of its weight resting on separate supports” (Fig.3). The parts are produced with 16-cavity molds, as with the existing machines. The tweezer discs, which are pre-positioned in the peripheral equipment with cavity spacing, are inserted into the mold by a handling appliance (Fig.4a+b and Fig.5). A separate parts removal device, which enters the mold space from the ejection chute, i.e. vertically from below, removes the composite parts and transfers them to a separating system, which stores the parts separately according to cavities. Asked to describe his experience with the new equipment, Martin Varch sums up as follows: “When comparing the EcoPower line with the machines from the original investment, we found primarily one vital improvement: although the new line is only slightly faster than the existing machines, because their production cycle is limited by the speed of the metal parts handling equipment, its consistency in production and consequently the quality standard of the parts are significantly higher. However, a recently acquired additional EcoPower 110 has demonstrated that the new Eco machines are well able to play out their superiority in terms of manufacturing speed too. It produces high-precision components for the vibration heads of electric shavers and is not dependant on the speed of peripheral equipment. In this instance, the cycle time was halved. At the same time, the reject rate dropped to almost zero. 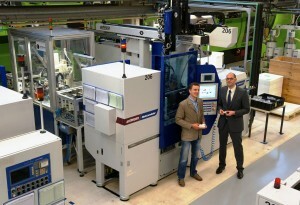 In this way, one new machine was able to replace two old ones, as Wittman Battenfeld’s regional sales manager Bernd Aigner finally puts it with mixed feelings.